Greenpeace activists have been known to take strong steps to get their message across, but this latest stunt—aimed at garnering attention during the UN climate talks in Lima—may have caused irrevocable damage to one of Peru’s most sacred sites. In fact, this massive eco-blunder has earned them criminal charges from the Peruvian Government. The Nazca lines, created between 1,500 and 2,000 years ago, earned this site a UNESCO World Heritage designation over 20 years ago. The area is so fragile, and so very sacred, that presidents and high-ranking officials have been forbidden from setting foot anywhere near it – so one can only imagine the public outcry about the disrespect that Greenpeace has shown by trespassing here. The Nazca geoglyphs were created by digging away the red pebbles on the plateau to reveal the clay beneath. Visible only from the air, they’re believed have uses related to astronomy and fertility, and some have even claimed that they served a more otherworldly purpose. The shapes, which number in the hundreds, depict everything from geometric patterns to birds, snakes, mammals, and fish. Many people are familiar with the hummingbird, spider, and monkey glyphs, but there are countless others that are also recognized the world over. They have been preserved over the centuries because Nazca receives only minimal rainfall, so the pebbles haven’t been disturbed. All of the images are extremely fragile, as the lines can be disrupted if just a few pebbles are moved from their current placement, and a single footprint can leave an impression that’ll last hundreds, if not thousands of years. The damage that was done by a bunch of Greenpeace folks tromping about and placing signage all around the area is almost inconceivable, and may carry some heavy penalties for everyone involved. 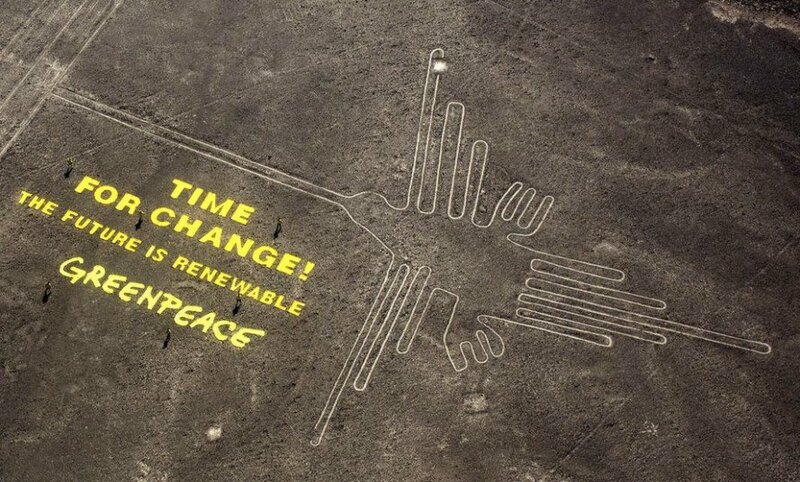 Greenpeace has issued a public apology for Peru for this horrible gaffe, claiming that they had wished to express an urgent message of hope to the UN leaders, but instead came across as crass and careless. That apology is all well and good, but isn’t going to roll back the damage they caused to this fragile site. The Peruvian government is asking prosecutors to file charges against the activists, including a possible charge of attacking archaeological monuments. If found guilty, those involved could face up to six years in jail. how was the message put on the ground ? it looks like it might be painted fabric. 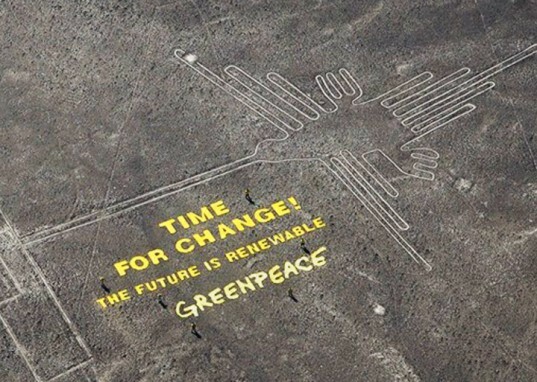 and has greenpeace cleaned it up...anyway. i would really like to know if tis has been resolved. Another view of the offending banner. Greenpeace activists have been known to take strong steps to get their message across, but this latest stunt—aimed at garnering attention during the UN climate talks in Lima—may have caused irrevocable damage to one of Peru’s most sacred sites. In fact, this massive eco-blunder of theirs has earned them criminal charges from the Peruvian Government. The Nazca lines, created between 1,500 and 2,000 years ago, earned this site a Unesco World Heritage designation over 20 years ago. The area is so fragile, and so very sacred, that presidents and high-ranking officials have been forbidden from setting foot anywhere near it, so one can only imagine the public outcry about the disrespect that Greenpeace has shown by trespassing here. 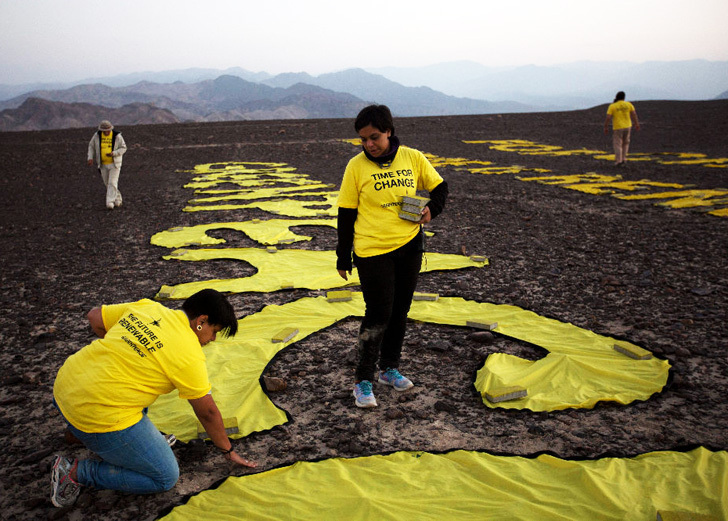 Greenpeace activists have been known to take strong steps to get their message across, but this latest stunt—aimed at garnering attention during the UN climate talks in Lima—may have caused irrevocable damage to one of Peru's most sacred sites. In fact, this massive eco-blunder has earned them criminal charges from the Peruvian Government. The Nazca lines, created between 1,500 and 2,000 years ago, earned this site a UNESCO World Heritage designation over 20 years ago. The area is so fragile, and so very sacred, that presidents and high-ranking officials have been forbidden from setting foot anywhere near it - so one can only imagine the public outcry about the disrespect that Greenpeace has shown by trespassing here. The giant hummingbird geoglyph in Nazca, Peru.